Wood has some unique properties that allow it to contribute to noise reduction in buildings and in industrial applications. Industrial noise control has gained considerable importance due to the requirements established by OSHA. Audible sound is a propagation of energy which is commonly measured in terms of decibels (dB). The lower threshold of human hearing is 1 dB, and 130 dB is considered the threshold of pain. Examples of typical sound levels are: Rustle of leaves, 10 dB; ordinary conversation, 40 dB; and heavy traffic, 90–95 dB. Since sound in air is energy in motion, sound waves may be absorbed by a surface or reflected. 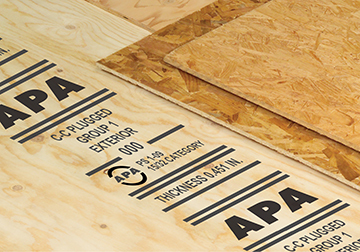 Plywood, like other materials, will absorb some of the sound energy and reflect the remainder. Relative coefficients of sound absorption are given in the table below. A material that exhibits perfect absorptivity is rated as 1.0; a perfect reflector of sound would have a coefficient of sound absorption of 0.0.